Titles include Captain Marvel #17, Daredevil #55, Exiles #39, Fantastic Four #508, New X-Men #150, Runaways #9, Spider-Man/Doctor Octopus: Ourt of Reach #2, Uncanny X-Men #435, Wolverine #9 and X-Treme X-Men #37. 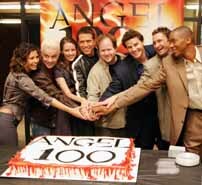 The WB series Angel reached its 100th episode last week with the production of the "You're Welcome" episode. The network released an image from a celebration at Paramount Studios in Los Angeles. Pictured are Charisma Carpenter (Cordelia), James Marsters (Spike), Amy Acker (Fred), Alexis Denisof (Wesley), Joss Whedon (Creator and Executive Producer), David Boreanaz (Angel), Andy Hallett (Lorne), J. August Richards (Gunn). The "You're Welcome" episode is scheduled for a Feb. 4 broadcast. In other Angel news, upcoming episodes include a repeat of "Unleashed" on Wednesday, Dec. 17 and "The Cautionary Tale of Numero Cinco" on Wednesday, Dec. 24. Titles include WildGuard: Casting Call #4, Shadows #4, Mythstalkers #6 and Trakk Studio Edition. Marvel's cult-favorite, teenage runaway heroes of the past meet Marvel's cult-favorite, teenage runaway heroes of the present in February's Runaways #11, the start of the new story arc from writer Brian K. Vaughan. In "Lost & Found," a new two-issue story arc Vaughan's on-the-run team of teenage heroes meet their predecessors -- two streetwise crime fighters who can teach their younger counterparts a thing or two about dark forces, dangerous pyrotechnics and 1980's fashion sense -- Cloak & Dagger. Art is by guest-penciler Takeshi Miyazawa, with covers by Joshua Middleton. Runaways #11 will go on sale on Feb. 4. CrossGen Entertainment on Wednesday revealed its creative team for the Negation War: writer Tony Bedard, penciler Paul Pelletier, inker Dave Meikis, and colorist Laura Martin. The six-part event launches in March. "For nearly four years, the building storm has been teased and hinted at in the pages across CrossGen's entire line. The mad-god Charon, having conquered his chaotic universe, has cast his baleful eye across the gulf between realities and covets the bright and thriving worlds in our cosmos. Backed by endless armies and his twisted Lawbringers, the terrifyingly charming emperor has at last given the order to launch the full invasion. Can anything stop the Negation's path of destruction? And who is the spandex-clad hero shown on the first issue's cover? Readers will uncover answers as they join the battle in only three months." "Charon wants to 'improve' the CrossGen Universe, whether we want it or not, because he feels he knows what's best for everyone...and he'll kill as many people as it takes to do it," Bedard said. "The CGU crew is definitely outmatched. But that's what makes things interesting. You gotta love the underdog. In the pages of Negation, ex-soldier Obregon Kaine and his rag-tag band of escapees have beaten immense odds in their fight for freedom. And along the way, there's been a multitude of 'Holy $#+%; moments, so expect even more of those jaw-dropping shocks in Negation War!" The first issue will be 32 pages, will cost $2.95 and will be in stores on March 24. Dreamwave Productions has provided The Continuum with six preview pages from Maximo, the one-shot based on the Capcom video game. Beau Smith, the writer of the upcoming Capcom video game Maximo II, writes the comic. Maximo finds himself once again called on to save a kingdom from the clutches of evil. This time evil comes in the form of Skabb and his legion of decaying demons of death known as The Rot. This comic brings all the action of the video game and gives the readers an extra layer to the story of Maximo! The art is by Alan Wang. "Maximo was such an amazing game and I'm really excited to have this oppurtunity to be the first to translate Capcom's infamous Maximo franchise into a comic book," Wang said. "With Beau Smith at the helm, and Maximo 2 just around the corner, this is going to be a very exciting yeah for all of us here at Dreamwave and Capcom. Maximo, Beauty is only sword deep..."
Maximo, a 40-page one-shot, will arrive in stores in January and will cost $3.95. Click on the thumbnails above for larger images. Above is a first look at new Spider-Man cars from Johnny Lightning. They will be available in April. Cillian Murphy has landed the role of an unnamed villain in the new Batman movie from Warner Bros. according to Daily Variety. Smallville star Tom Welling will be a guest on Live with Regis and Kelly on Tuesday. Arturion Entertainment, an inactive public company, has agreed to acquire all of the outstanding membership interests of POW! Entertainment. POW! is in the business of creating and licensing intellectual property for the entertainment industry, including feature films, television programming, animation projects, video games, merchandising and related entertainment venues. Stan Lee is a founder and the Chairman and Chief Creative Officer of POW! Dreamwave Productions' publication of Drew Struzan: Oeuvre has been rescheduled for a later date. "A decision had to be made," Struzan said, "a book of lesser quality now or the book we have all been anticipating with the quality we wish but at a later date. We opted to postpone for quality sake because the book will be out there for all time and it must represent the artwork as it is meant to be seen. Our regrets for the delay, but we believe that patience will pay off in the quality you deserve." According to Dreamwave, Drew Struzan: Oeuvre is "a biographical look at the artist's ability to overcome hardship to fulfill his dreams and in turn leave his mark in pop culture history." The book also collects Struzan's body of work in one complete volume. Coming Friday: Animation news -- and much more!!! * For Friday, Dec. 5, including Daredevil movie news, CLICK HERE. * For Thursday, Dec. 4, including DC news, CLICK HERE.